With all this rain, the mushrooms are growing like crazy. The woods will be very busy this weekend. Please be conscious of our cumulative impact, and extra respectful of the woodland inhabitants. 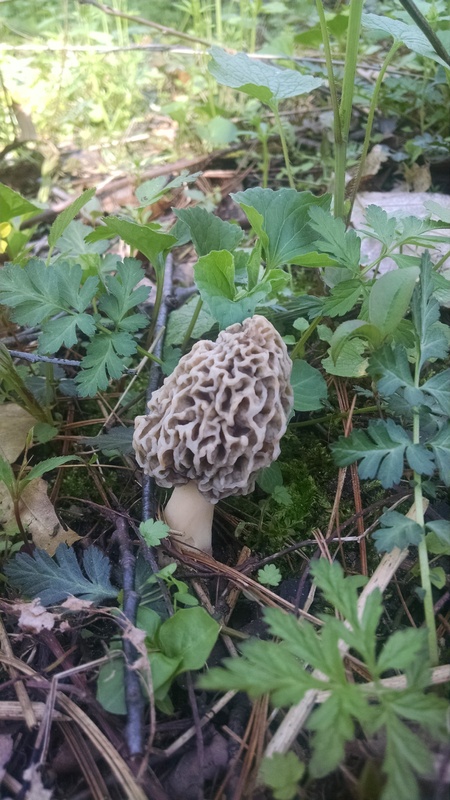 When you are searching for morels, a mindful search of an area will yield more than beating aside vegetation. Scan each section of ground from 2 or 3 different angles as you move through the woods by bending and twisting to get different views. 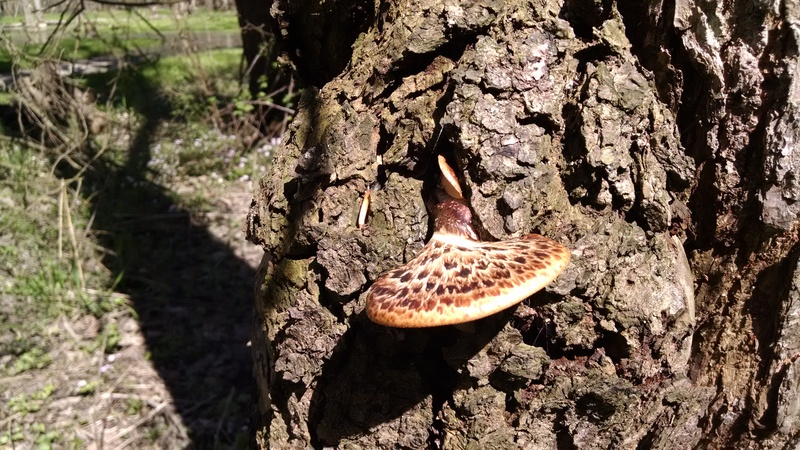 In addition to morels, dryad’s saddles, also called pheasant backs, are fruiting heavily right now. This polypore mushroom has a distinct, fresh cucumber-watermelon odor when cut. Harvest young mushrooms, while the pores are still closed. If it is firm and juicy, it is good. If it is tough, leathery, spongy, or soggy, it is not. These mushrooms are good sliced and sauteed, but even better in soups and stews. The dehydrated mushrooms do not rehydrate well, but when soaked, they will produce a deep, rich mushroom broth. 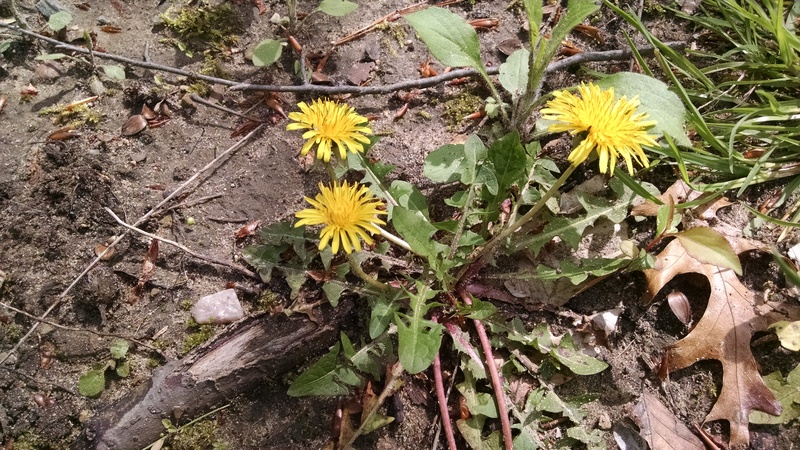 Dandelion greens are past season in most places already. But dandelion flowers are everywhere. Soak the unopened flower buds in seasoned brine for a nice quick pickle. The opened flowers are a great way to introduce friends and family to eating foraged foods. Remove the yellow petals from the base and add them to salads or desserts. Or use them to make a beautiful, pale yellow jelly. The flowers also ferment well, making delicious cordials and wines. 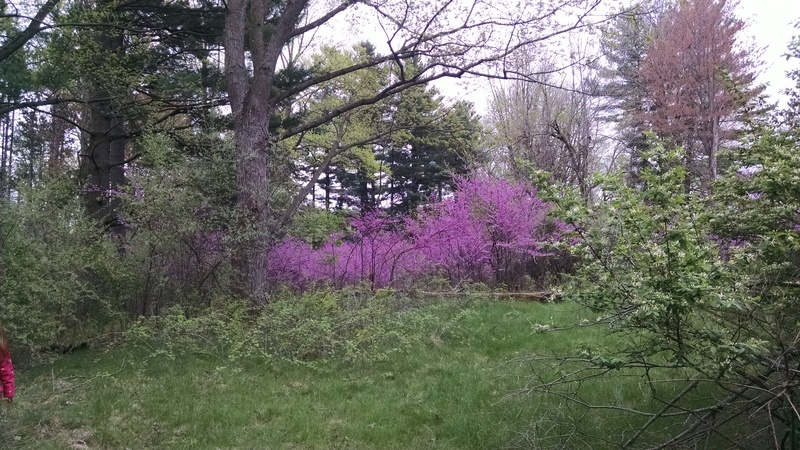 Redbud trees in bloom can be easily identified from a distance by their distinct color. Kids love picking these because the tufts of flowers are perfect for little hands. The beautiful blossoms have a delicate sweet-floral flavor. They make a great trail snack, and are a wonderful way to add color to your plate. Watch for the tiny, heart shaped leaves to emerge over the next couple of weeks. These leaves are edible when they are young, but as they mature they become fibrous and tough. Violets are in full bloom in our area. These beautiful wildflowers will cover large areas of the woods, and can often be found in abundance. The purple flowers can be eaten fresh, made into jelly, infused into vinegar, or if you are really adventurous, candied. The leaves are also edible, and unlike many plants they remain tasty even after the plant flowers. 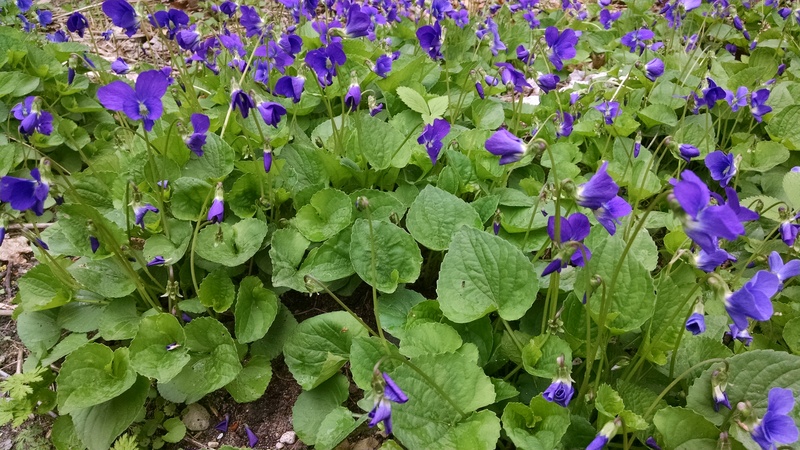 Some time this week, make yourself a nice spinach and violet leaf salad with violets, redbud flowers, and dandelion petals. Spring on a plate. Knotweed season is going by quick. Knotweed shoots spring up very quickly, and the weather over the past couple of weeks has been ideal for them. 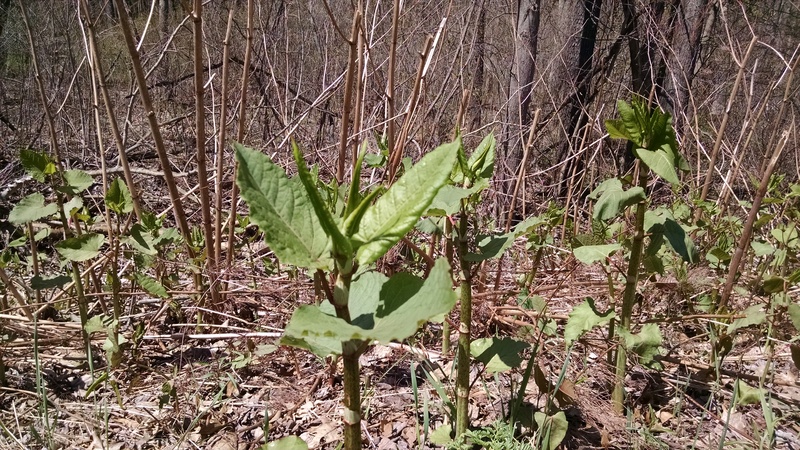 If you want to harvest knotweed this year, you should probably do it soon. Look underneath and around the taller plants for the younger shoots. This plant makes a musical popping sound when you pick it. Don’t worry about overharvesting, this is an invasive species. So go ahead, play a tune. But make sure you cook everything you pick, even the parts you don’t plan to eat. Because this plant spreads readily from cuttings and discarded leaves, and can survive drying and composting. Want more seasonal recipes and foraging tips? Join our email list to get wild food recipes and regular updates on seasonal foraging conditions in southern Michigan. No spam, just our posts.